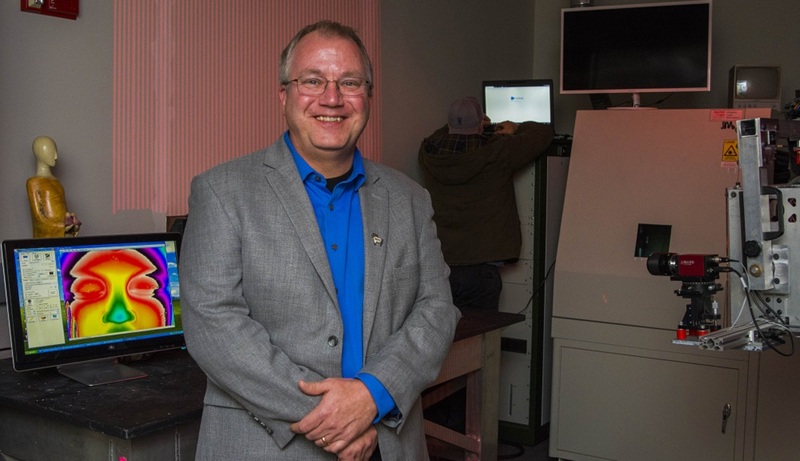 WPI, in collaboration with Quinsigamond Community College, is in the process of developing an AIM Photonics Academy Lab for Education & Application Prototypes (LEAP). The lab will support the development of the integrated photonics manufacturing sector in Central Massachusetts. The university recently received $4 million from the Commonwealth of Massachusetts to develop this center. Photonics, the science of light, is embedded in technologies of daily life, such as smartphones, medical devices, and autonomous vehicles. The AIM Photonics Academy is a part of the AIM Photonics Institute, which falls under Manufacturing USA, a public-private partnership that took effect in 2014 when President Barack Obama signed the Revitalize American Manufacturing Act. That measure is to scale up 21st Century advanced manufacturing technologies and processes in the US to maintain our competitive edge in the world economy. WPI is involved in eight of the institutes, which focus on a range of areas, including integrated photonics, robotics, biomanufacturing, and clean energy. The Daily Herd recently sat down with Doug Petkie, head of the Physics Department and the WPI lead for the AIM Photonics Institute under Manufacturing USA, to learn more about this new photonics initiative. Herd: What is photonics and why is it important? Petkie: Photonics is an area of technology that involves transmitting and processing information with light, or photons, instead of with electrons, or electricity. This provides a much larger pipeline to transfer information and allows for some pretty amazing things to take place. For example, photonics technologies and fiber optics move massive amounts of information around the Internet. Massachusetts’ initiative to connect more communities to this infrastructure will drive the need for data centers to transfer more and more information as additional communities become connected. This requires ever increasing data transfer rates with significant energy costs. Integrating photonics and electronic technologies onto the same chip is a game-changing technology that will move more information around faster at lower energy costs. Integrated photonics has significant impacts on a number of industries ranging from medical to automotive. For instance, WPI is partnering with Massachusetts Eye and Ear to develop photonic tools for studying hearing and speech, with the hope of leading to more advanced products such as endoscopes to diagnose the health of eardrums. On the other end of the spectrum, we’re researching how to develop navigational instruments for autonomous vehicles. Herd: So this has big implications for a number of industries? Petkie: It has very broad implications. With a new technology platform such as this, an expansive supply chain will emerge to play a role in launching new products, from new design tools to new ways to assemble and package the devices, to the human and social aspects associated with any disruptive technology. Herd: How does WPI fit into this? What value is WPI bringing to this initiative? Petkie: We have several distinctive strengths. The first is our signature project-based approach to undergraduate education where students and faculty work with industry partners to come up with solutions to relevant problems. Every single student is involved in at least two significant projects that help shape our technology and communities. We also bring strong collaborations across many disciplines for this photonics initiative. It’s about integrating medicine with engineering, leveraging scientific discoveries for new applications, identifying benefits for community stakeholders, and understanding the impact on society. There’s not only the talent in each of these fields, but strong cross-disciplinary work with very low barriers to collaboration. Through our project-based learning, we have strong partnerships on campus and with industries and organizations throughout the region and around the world. We’ll be joining a great national team of researchers working in this field, and WPI will bring a holistic approach to engage Central Massachusetts in the development of advanced manufacturing around integrated photonics. Herd: What specific example in our own research can we point to that has a photonics component? Petkie: There are several examples. Take the research being done by Professor Cosme Furlong’s group, which is working with Massachusetts Eye and Ear to develop photonic tools for hearing and speech research, or the collaboration of professors Shawn Liu and Qi Wen, who are developing fiber-optical tweezers that allow researchers to control the position of single cancer cells. That tool can potentially be used for early-stage cancer diagnosis. Also, Professor Balaji Panchapakesan’s group has developed nanomaterials that could be used for new telecommunications or lab-on-a-chip devices. Herd: That’s really impressive. So there’s a lot of potential with photonics it seems. Petkie: There’s a lot of innovation and creativity in this area, particularly when coupled with new capabilities. For instance, it has only been about three generations since the invention of the transistor, and now we have computers we can hold in our hand. We need a sandbox of ideas to bring people together to push the limits of our imagination on what the next technologies will arise from our societal needs. But there’s not necessarily a clear-cut answer here. Herd: An answer to what? Petkie: The next killer app. Industry would love to know it. Everyone would love to know it so they could invest in it. The whole thing about innovation and entrepreneurship is that you need a vibrant ecosystem to go through a value creation process to come up with, for example, the next medical sensor that will detect diabetes using a sensor in your cell phone. Ren test an integrated photonics chip. Herd: So it’s tough to predict? Petkie: You can’t predict or map the next big breakthrough. It has to be in an ecosystem, where there’s trial and error and people taking risks on sometimes good ideas and sometimes bad ideas. And through those combined efforts you get to the next level. It’s not just about the technology, but finding the right questions to ask and identifying societal needs. Herd: What’s this ecosystem you’re referring to? Petkie: The ecosystem of Central Massachusetts, which includes many academic institutions such as WPI and QCC, as well as many industries that already play a role in the traditional photonics industries. WPI and QCC have programs with the K-12 communities and strong programs from associate degrees and continuing education all the way through PhD programs. The funding from the commonwealth through the Massachusetts Manufacturing Innovation Initiative (M2I2) program promotes these synergistic connections as well as the educational leadership of AIM Photonics Academy at MIT and the investments made at the national level by several government agencies—the Department of Defense, in the case of AIM Photonics. Herd: We understand WPI will have education and industry partners in this effort. What does that entail? Petkie: Along the I-90 corridor, we want to develop a network where many different ideas can be pursued, whether it’s in Worcester or Boston or Springfield, and each of those regions can work together. WPI has the expertise to facilitate the design of photonic-integrated circuit systems that would then be fabricated at a state-of-the-art AIM Photonics facility at SUNY Polytechnic in Albany. The device would then be returned to WPI, where companies and students can test out the characterization and performance of the system. And that goes through a performance evaluation in terms of determining how you can make the product better. Once you go through those iterations, it goes to a facility in Rochester, N.Y., for assembly and packaging and gets closer to a final product. Then it comes back to WPI and QCC for further validation and testing on the product before being distributed to industry partners. Herd: That’s quite a process. Do you anticipate WPI undergraduate students and graduate students working on this? Petkie: Absolutely. Groups of students will work closely with our partners and with QCC on this initiative. As part of the workforce development, combinations of undergraduate and graduate projects will use a balanced approach to develop the new manufacturing technologies as well as identify needs. For a student to get involved at this level is pretty impressive. We’re talking about an emerging technology. There are a few companies using it in the datacom and telecom arenas, but they don’t have the time to support all the other ideas out there, so we’re here to support the other ideas. In some cases, we could play a small role in facilitating a company’s entrance into integrated photonics. In other cases, more extensive projects will be overseen by students working with a company, or perhaps result in students and faculty creating their own company. Herd: Can you talk a bit about the integration with Quinsigamond Community College? Petkie: QCC is an essential part of the team that provides a broad pipeline in workforce development activities and increases the impact of the project. It has impressive training facilities and this partnership will give both WPI and QCC students a larger perspective of the supply chain needs for 21st Century manufacturing. We’re really looking forward to a strong partnership with QCC and other members in AIM Photonics. Herd: We understand there’s a workforce training component here. Can you talk about that? Petkie: We’re using the basis of our project-based learning to engage WPI and QCC students in learning about the science and practicing with state-of-the-art equipment associated with these technologies. Industry’s going to tell us what they need and we’re going to make sure the people working on it understand that and get the training they need to be successful in that industry. We will have students, faculty, and industry partners working in a space to move the science and engineering of integrated photonics forward. We’re going to do everything we can to ensure that the future workforce has the skills and mindset needed to be successful and adapt to an ever-changing technological environment. Petkie: … be an exciting area of industry, but we still won’t have all the answers. The integrated photonics field has untold potential and impacts so many corners of research—from medicine to aerospace to automotive. I’m thrilled that WPI is at the forefront of the photonics industry, and that we have the potential to make significant impacts not only in our backyard, but around the world. Learn more about the WPI and QCC Partnership through the press release.